Beast of the Alamo is the UK DVD title for the American TV movie Chupacabra vs. the Alamo. The movie was produced for the Syfy Channel and first aired 23rd August 2013. If the title sounds pretty lame, don’t worry, the movie is worse, but it is a must-see for anyone who has ever wondered what would happen if a ludicrous storyline and poor acting were to be combined with some dodgy CGI effects. The movie begins with some drug dealers doing business in a tunnel. Like any self-respecting drug dealers they are packing firepower, but none of them anticipated having to deal with a pack of chupacabras so—guns or no guns—the only thing that goes down in the tunnel is them and by the following morning, DEA agent, Carlos Seguin (Erik Estrada), is already on the case and chalking up the carnage as just another drug deal gone bad, despite the fact all the bodies are strangely devoid of blood. Seguin’s new partner, Tracy (Julia Benson), is also in attendance and she is not so quick to put the blame on a rival gang, especially after she nearly falls victim to a stray Chupacabra that is loitering around the previous night’s meal. Fortunately for her, Seguin shoots the beast before it can find out if she is as tasty as she looks, but Seguin seems to need a pair of glasses because he believes the CGI nightmare is just a hyena. Tracy does not agree, so she goes above his head, takes the beast in for examination, and the medical examiner backs her up. It’s not a hyena, it’s a chupacabra and—just to make matters even worse—it’s a rabid chupacabra (always the worst kind). Pretty soon packs of rabid chupacabra’s are wandering all over San Antonio, and Seguin, who has been taken off the case, is forced to team up with his estranged son and his son’s gangster buddies. Some of Seguin’s friends from station also offer him their services, and the combined talents of this unlikely mob are the last and greatest hope for the good people of San Antonio, and they make their last stand at the Alamo. Erik Estrada is probably best known for his role as Officer Frank Poncharello in the TV series Chips. Back then he played a motorcycle highway patrol officer and, all in all, it was a pretty good show. He gets to ride a bike again here, but the scenes showing him on the bike are so poor they are laughable and it is all too easy to tell he is sitting on a bike in front of a screen showing projected scenery. This aside, Estrada does look every bit the tough guy cop he is supposed to be, but his character never comes across as believable. The rest of the cast is equally unconvincing though, so he is in good company. There is no doubt that Estrada and some of the others are capable of providing much better performances, so it is somewhat of a mystery what has gone wrong here. The script is incredibly poor, so that may be a big part of the problem, and maybe the director must shoulder some of the blame, but the poor quality CGI effects used may suggest there was not enough money in the pot. Or perhaps the movie was a rush job. 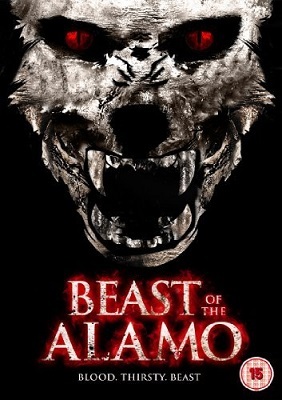 For whatever reason, Beast of the Alamo has very little going for it and is substandard to any number of indie movies. — A rumoured tunnel in the Alamo is found very quickly when a means of escape is needed and the fact that it has been hiding in a cupboard for decades, with a few boards nailed over it, makes it all the more surprising it was not discovered sooner. — San Antonio seems to have a distinct lack of citizens. — The Chupacabra wipe out a gang of drug dealers and kill the toughest cop in the department, but Seguin’s daughter successfully defends herself with nothing more than an electric carving knife. Moments later she nukes the dead monster’s amigo by throwing it inside the microwave oven. Not to be left out, her best friend steam irons a chupacabra to death. — A cop’s dog becomes dog food so he takes out his camera instead of his gun and becomes just another chupacabra lunch date. There are many more examples, but interested parties will need to inflict themselves with a viewing if they want to know more. The subplot about Seguin trying to pull his family together after his wife’s death is effective, but it is lost on this movie. The movie could also have been improved by further exploring the relationship between Seguin and Tracy, even then it would still require a small miracle to make the story work. The most shudder-worthy scene? Easily the one where a teenager wrestles himself free from his girlfriend and goes to take a leak—bad idea because a sausage-loving chupacabra makes a quick meal of his equipment and leaves him peeing blood down his trousers and onto his girlfriend—a thing like that can ruin even the best of relationships. Beast of the Alamo is probably a movie that Erik Estrada fans all over the world will want to see, but should probably be avoided by everyone else except those who are exceptionally brave when it comes to frighteningly bad movies. My advice is, forget Beast of the Alamo and watch An American Werewolf in London instead. The storyline is more believable, the characters are more interesting and, even though it was made more than 30 years before Beast of the Alamo, the special effects are infinitely better.